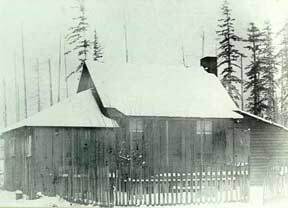 A second wave of settlement in Cedar Mill took place in the 1870s after many donation land claims were broken into smaller parcels. Much of the acreage was purchased by immigrants who had traveled west in search of productive farm land. Since many of these tracts had been logged off by local mills, the stump land here appeared suitable for the arriving Europeans intent on farming. The immigrants represented a variety of nationalities, although most were from Germany, Switzerland and Ireland. Following lengthy voyages across the Atlantic, they entered the United States at ports such as New York or Boston. Some crossed the plains in wagons; during the 1870s others came by the newly established railroad system. Many came to Cedar Mill assured of food and shelter provided by friends and family already in the vicinity. In time, small groups of each nationality began to form in and around Cedar Mill, and their cultural traditions enriched the community. The Swiss worked together in dairy farming, the Irish helped establish St. Anthony Catholic Church, and Germans contributed to the rising agricultural economy. Although most of the early Europeans intermarried with families from their native countries, late generations tended to marry into other cultural backgrounds. Some moved from the area, while others have remained for more than a century since their ancestors arrived from the Old World. A few Swiss and German immigrant descendants relocated at Cedar Mill from nearby Bethany. Surnames such as Leahy, Murray, Stalder, Jenne, Hamel, Hickethier, Bauer and Katterman serve as a reminder of the immigrant farmers who came to the area long ago. Their stories provide and interesting study of the development	of the land. Settlers of Irish heritage were among the first immigrants to reach Cedar Mill. Two of the earliest were Thomas and Ann Leahy from County Waterford, Ireland. In 1852, the couple crossed the plains and settled in the Goose Hollow area immediately west of Portland. By 1865, Leahy had moved with his wife and infant son John to a sloping 160-acre timbered parcel on NW Leahy Road that he purchased for $1,000. Leahy cleared some of the land and planted various crops. Three more Leahy children, Hugh, Ellen and Thomas Jr., were born in a small house built on the acreage. Although the house is gone, a row of poplar trees on	the west side of Leahy Road indicates the site. Thomas Leahy died in 1894, followed by Ann in 1913. Ann's property was divided among their children. John and Hugh logged the family property and cut cordwood from the downed timber. The wood was sawed into four-foot lengths, hauled by wagon over Cornell Road and sold to a Portland brewery. The Leahy brothers also raised hay that they sold to the West Hills Dairy on nearby Cornell Road. John and his wife Kate had nine children including their oldest daughter Maude Leahy Murphy. Maude recalled walking to Cedar Mill to bring the mail home from the general store post office. On other occasions she was given 50¢ and instructed to purchase eggs at the store. The eggs were precariously placed in her apron for the trek home and often many broke on the return trip. Ironically, both John and Hugh Leahy died in logging accidents on the family property. John was clearing a path used by school children in 1929 when the tree he cut fell over him and killed him. Hugh died in 1940 from	injuries	he received	while prying bark off an old fir	tree. Leahy descendant Dolores De Young Fallon and her family continue to reside on a portion of the original tract near 92nd and Leahy	Road. The name Murray Road serves as a reminder of one Irish immigrant family who settled in the area. Owen Murray came to Oregon from San Francisco, where he had become a citizen in 1876. The next year he bought a 200-acrea tract in Cedar Mill. The property purchased included the sloping forest area from NW Pettygrove south to Highway 26. Probably not long after his arrival he built a two-story frame home next to several sprawling oak trees on Cornell and NW Trail. On the 120 acres they eventually cleared for farming, the Murrays raised horses and a few cattle. A 20-stall	horse barn -- rather large for those times ñ was constructed	to house the animals next to the family home on Cornell. The Murrays belonged to St. Anthony Catholic Church, and, for a while at least, son Joe attended the parochial school adjacent to the church. The children were later enrolled at Union School, nearer	their home. Murray died in 1909, and his younger son passed on in 1915. The older Murray son, Joe, raised dairy cattle on the farm he managed for his mother. Joe also worked for other farmers in the area and was for many years a colorful resident of Cedar Mill. He usually appeared for work wearing a soiled work cap and in later years sported a long red beard. Children were both fascinated and frightened by his unkempt appearance and flamboyant character. One of the bachelor's	habits was his weekend visits to Portland for entertainment ñ the return to Cedar Mill was announced by his loud whistling as he drove his team down Cornell Road. In 1936, the consequences of the Depression and Joe's easy-going management contributed to his financial ruin. But before he gave up the farm, Joe investigated the legend of Owen Murray's gold. Supposedly his father had brought with him $90,000 in gold when he came to the United States. Joe searched the property in vain, looking for the fortune and, as a last resort, hired two men from Portland to recover the sum. The men dug a large hole in the barn, but the gold was never found. Eventually, Joe was forced to sell his 200-acre farm to cover his debts. Two Bethany brothers of German descent, Herman and Jack Jenne, secured the tract in 1937. The property remained in the Jenne family until the last portion was sold in 1961. This land later became the Terra Linda housing development and the Sunset Mall shopping	center. Joe remained nearby in a small rented house next to the Stalder property and continued to work for farmers in the area. Ed Lehman hired Joe to work on his rented farm where Joe operated a mowing machine. One August day in 1947, Joe suffered a fatal heart attack	as he was cutting hay for Lehman. Fittingly, Owen, Mary, Joe, Thomas and Ann are all buried along Murray Road in the St. Anthony cemetery. Many immigrant descendants in Bethany and some in Cedar Mil trace their origins through the 1876 Siegenthaler Migration, organized in Langnau, Switzerland. Led by Samuel Siegenthaler, the group of 72 people from ten families began their exodus in search of religious freedom and greater economic opportunity. Before the party left, their Swiss leader corresponded with at least one Tualatin Valley	settler to arrange for the immigrants' arrival. The families pooled their financial resources. Those unable to afford the journey were assisted by Siegenthaler, who purchased all the necessary tickets. After crossing the Atlantic to New York, the party took 12 days to reach Philadelphia. From there they boarded a third-class immigrant railroad car bound for Omaha. Few comforts were available on the train, which had no sleeping or eating facilities. The immigrants were forced to rest on the floor of the car, and food was obtained only when the train stopped at towns along the	way. In Omaha, the group changed trains, to the Union Pacific, taking another four days to reach Sacramento. A steamer brought the party from San Francisco to Portland where they completed the five-week	journey from Switzerland. Once in Portland, they obtained lodging, and the following day Siegenthaler and several of the men walked out to Cedar Mill. Prior arrangements had been made for food and shelter, and when these had been assured, wagons were sent to Portland for the remaining	immigrants. The Swiss purchased land immediately, and again Siegenthaler helped those in the party who needed financial assistance. After it was cleared, the acreage purchase by the families supplied excellent soil for dairy and general farm crops. Milk, cream, cheese and butter produced on the farms were sold to a ready Portland market, including	several large hotels. As the immigrants became prosperous, they purchased additional property in the vicinity. John Siegenthaler, Samuel's brother, once owned a large tract in the southwest portion of Cedar Mill. Another Siegenthaler descendant, Louis, operated the Sun Rise Mill now standing unused near Highway 26 and NW 158th. For many years local farmers took their grain to the mill to be cleaned. Siegenthaler also sacked	and sold excess grain he bought from farmers. A number of families in Switzerland continued to communicate with Siegenthaler and were encouraged to come to the Tualatin Valley. One such family was the Stalders, John and Marianna, who left their homeland in 1878 and settled in Bethany. Most of the land the couple	purchased had to be cleared for farming ñ accounts of task	have been recalled by Stalder family descendants. Holes were first bored into the trunks of standing timber which were packed with live coals. It was never known which direction the old giants would fall but once they were down, holes were bored all along the truck and more hot coals were inserted until the trees slowly burned away. This would be considered wasteful by today's standards, but to early settlers timber was a hindrance to successful	farming. The Stalders continued to clear the land while raising their 12 children. John Stalder had a downtown route for his produce and made regular trips over Cornell Road to supply his customers, taking his gun for protection from wild animals. In 1906, the youngest child, Paul, married Maria Hansen of Danish descent. They bought a 40-acre tract in Cedar Mill from the estate of Peter Senften two years later. The parcel was located behind Sunset High School on property that later became Sunset Science	Park. The young couple occupied the Senften home and gradually remodeled as their family grew. Eight children were raised here, Madeline, Irene, Richard, Rose, Marvin, Verna, Laura and Donald. Some of the land was already cleared of timber, but a large section on the north remained to be converted into usable farmland. During this time, Stalder engaged in various farming activities, producing wheat,	potatoes, loganberries, strawberries and dairy cattle. After Paul died in 1945, the family home continued to be occupied by Stalder children Verna and Marvin, while the farm acreage was leased to Ed Lehman. In 1961, the property was sold for the Sunset	Science Park development.